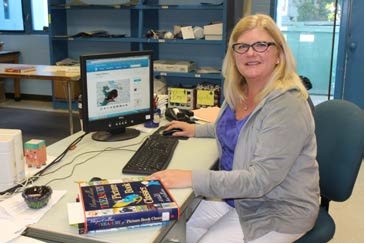 Linda Walker, art teacher at Burr Oak Community Schools, has a lot more room on her desk now that she has a flat screen monitor recently donated from Glen Oaks Community College. Burr Oak Community Schools, in cooperation with the St. Joseph County Schools Information Services, received 28 Dell Computers and 68 Dell monitors thanks to a donation from Glen Oaks Community College. 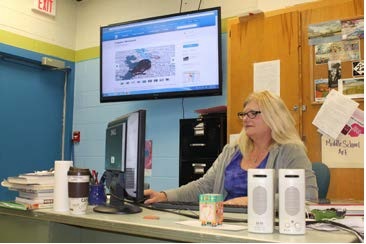 Linda Walker, art teacher at Burr Oak Community Schools, can now connect her computer to both her desk monitor and a large screen tv monitor, so that she can more effectively share course content with her students.